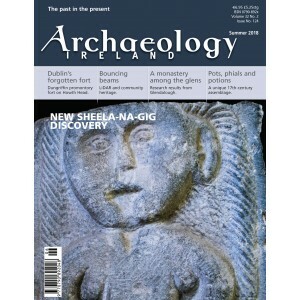 Gary Dempsey and Christy Cunniffe report the discovery of a Sheela-na-gig in County Galway and highlight the importance of field monument advisers. Alan R. Hayden describes a unique assemblage from a seventeenth-century Dublin apothecary’s shop. Matt Seaver, Conor McDermott and Graeme Warren describe ongoing research at the famous monastic complex of Glendalough. Daniel Curley, John Flynn and Kevin Barton showcase the use of LiDAR in community archaeology projects. Paul Duffy examines Fingal’s answer to the ‘Rathdown Slab’. Denis Shine, Stephen Mandal, Chris Hayes and Madeleine Harris describe preliminary results from the ‘Digging the Lost Town of Carrig’ research project in the Irish National Heritage Park. Mick Mongey describes investigations at Dungriffin promontory fort, overlooking Dublin Bay. In this contribution to the Know Your Monuments series, Muiris O’Sullivan and Liam Downey present an overview of the main types of traditional boat-landing features commonplace in coastal areas, and outline the important purposes for which they were employed down the centuries.